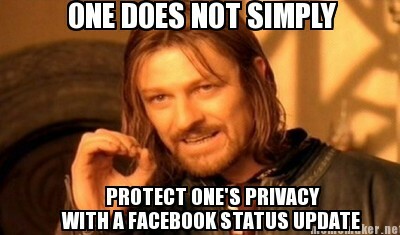 People of Facebook, please be advised: posting the “Facebook Privacy Notice” to protect your copyright will do NOTHING. I mean, absolutely NOTHING. Today, [INSERT DATE] in response to the Facebook guidelines and under articles L.111, 112 and 113 of the code of intellectual property, I, [Insert Name] declare that my rights are attached to all my personal data, drawings, paintings, photos, texts etc… published on my profile. For commercial use of the foregoing my written consent is required at all times. Those reading this text can copy it and paste it on their Facebook wall. This will allow them to place themselves under the protection of copyright. By this release, I tell Facebook that it is strictly forbidden to disclose, copy, distribute, broadcast, or to take any other action against me on the basis of this profile and/or its contents. The actions mentioned above apply equally to employees, students, agents and/or other staff under the direction of Facebook. The contents of my profile includes private information. The violation of my privacy is punished by the law (UCC 1 1-308 – 308 1 – 103 and the Rome Statute). Facebook is now an open capital entity. All members are invited to post a notice of this kind, or if you prefer, you can copy and paste this version. If you have not published this statement at least once, you will tacitly allow the use of elements such as your photos as well as the information contained in your profile. In brief – I reserve all my personal rights afforded & accorded to me personally by [Insert your jurisdiction] Law, and no one or anything has permission to use me or my information without new written and signed contract on paper with pen. 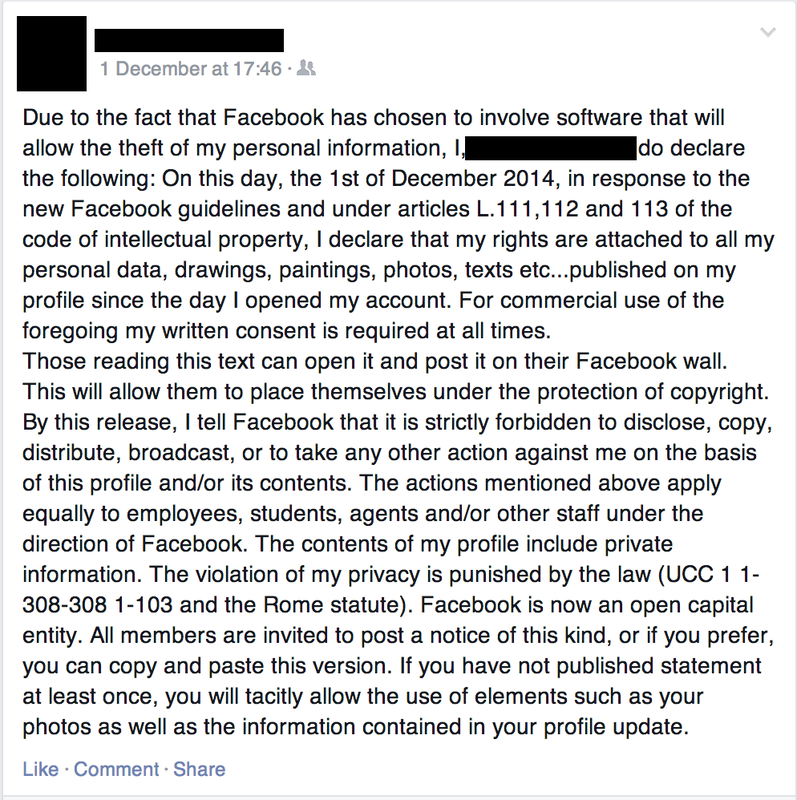 Due to the fact that Facebook has chosen to involve software that will allow the theft of my personal information, I, [INSERT NAME], do declare the following: On this day, [INSERT DATE], in response to the new Facebook guidelines and under articles L.111,112 and 113 of the code of intellectual property, I declare that my rights are attached to all my personal data, drawings, paintings, photos, texts etc…published on my profile since the day I opened my account. For commercial use of the foregoing my written consent is required at all times. Those reading this text can open it and post it on their Facebook wall. This will allow them to place themselves under the protection of copyright. By this release, I tell Facebook that it is strictly forbidden to disclose, copy, distribute, broadcast, or to take any other action against me on the basis of this profile and/or its contents. The actions mentioned above apply equally to employees, students, agents and/or other staff under the direction of Facebook. The contents of my profile include private information. The violation of my privacy is punished by the law (UCC 1 1-308-308 1-103 and the Rome statute). Facebook is now an open capital entity. All members are invited to post a notice of this kind, or if you prefer, you can copy and paste this version. If you have not published statement at least once, you will tacitly allow the use of elements such as your photos as well as the information contained in your profile update. (Anyone reading this can copy this text and paste it on their Facebook Wall. This will place them under protection of copyright laws.) By the present communiqué, I notify Facebook that it is strictly forbidden to disclose, copy, distribute, disseminate, or take any other action against me on the basis of this profile and/or its contents. The aforementioned prohibited actions also apply to employees, students, agents and/or any staff under Facebook’s direction or control. The content of this profile is private and confidential information. The violation of my privacy is punished by law (UCC 1 1-308-308 1-103 and the Rome Statute). The Uniform Commercial Code (UCC) provision that you cite is totally irrelevant; it has to do with Contracts of Sale within the 50 states of the United States of America. Which means that it applies to merchants selling goods under contract. As any law student will tell you, a contract can only be formed by way of offer and acceptance (whether in writing or not).You are not entering into a contract of sale with Facebook. Therefore, the Uniform Commercial Code is completely irrelevant. Especially if you’re using Facebook from outside of the United States of America. So…yeah. The “Rome Statute” is an international treaty that deals with prosecuting international crimes (such as genocide, crimes against humanity, war crimes, and crimes of aggression). Quite frankly, the International Criminal Court (the body responsible for investigating and prosecuting those crimes) couldn’t care less about the contents of your Facebook data, drawings, paintings, photos, and texts. In fact, if the International Criminal Court started prosecuting Facebook for stealing pictures of your instagram dinner, I’d be very angry, considering the current examples of genocide, war crimes and crimes against humanity going on in Syria and South Sudan (in addition to many more). There is no such thing as “The Code of Intellectual Property”. Enough said. The only thing that comes close to providing any semblance of legal protection is the mention of the “Berner Convention” (which is actually supposed to be the Berne Convention). The Berne Convention for the Protection of Literary and Artistic Works is an international agreement that governs the laws of copyright between different jurisdictions. However, you don’t necessarily need to declare protection under the Berne Convention to benefit from copyright protection laws: copyright protection over an artistic or literary work attaches the minute it is created, and lasts until 50 years after the death of the author (in most jurisdictions). Sure, it’s fun to use big, complicated terms like “Communiqué” or “Convention” or “Statute”. However, you can’t just take terms like that without understanding the meaning and purpose behind them. In terms of the law, one must understand, at least on a rudimentary level, what it is you’re saying and the effect that it is intended to have. This is the primary purpose why people dedicate their entire life to the study and practice of law – not just to understand what is the purpose of the law, but how to apply it. Next In the Crosshairs: Should the ICC prosecute US officials over CIA Torture?